During the German political upheavals of 1848 the brothers Richard and Otto von Schomburgk sided with the Liberals and, when the reactionary waves swept over Germany, they were on the black list. Otto who had taken a rather active part was arrested and sentenced to death which was later commuted to life imprisonment. Soon after, a small group of well-educated friends, among them the Schomburgk brothers, formed the Berlin Migration Society. It was largely made up of professional and business men and skilled artisans. With the help and intervention of their friends, Baron von Humboldt and geologist Leopold von Buch, they escaped the king’s resentment. The two brothers received generous aid, 300 thalers, from von Buch and they left their native land for South Australia. They, and several others, chartered and sailed in the Princess Louise (Prinzessin Luise), of 356 ton under Captain Bohr and left Hamburg on 26 March 1849, arriving at Port Adelaide on 7 August 1849. Among her passengers were Dr Muecke, Linger, Meyers, Harders, Schramm, Martin Basedow, von Rieben, Gunter, Deinow and Marianne von Kreusler. Some of these men also brought their wife and children. This single most important group of German migrants to come to South Australia was made up of 162 men, women and children. They were not religious refugees like the Lutherans who had arrived in 1838 and 1839. They were Political and to some extent Economic migrants. Their contribution to South Australia’s history, science and culture would be great and long lasting. Later arrivals to settle at Buchfelde were Johann Carl Gottleib Reinke and his wife Friederica Johanna, nee Radder. They had arrived from Mecklenburg on the barque Sophie on 2 August 1850. During 1850 painter Alexander Schramm visited Adelaide and the Torrens River where he painted a group of Aborigines. This painting has survived and is now housed at the National Gallery of Australia in Canberra. Dr Muecke was born in Prussia and educated at the universities of Berlin and Jenz. 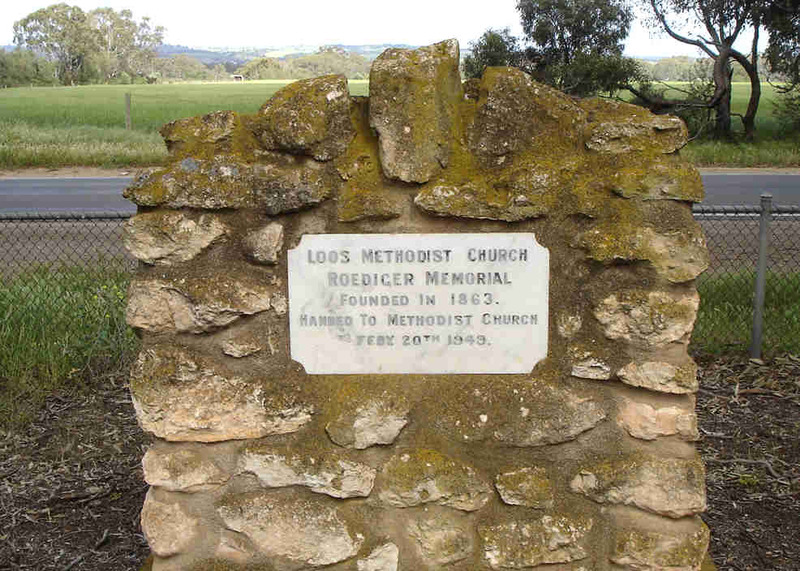 He became a Minister of the Tanunda Church in September 1850 and formed congregations at Lyndoch, Concordia, Buchfelde, (Buchsfelde) Schonfeld, Kingsbelt, Pine Hut, and New Mecklenburg. He also established the first German country newspaper, the Tanunda Zeitung. He married Otto Schomburgk’s sister but after 20 years in South Australia returned to Germany on 1 December 1869. The Register of 17 December 1850 reported that ‘The German Company has purchased a section of land about four miles from Gawler Town on the Gawler River. (section 44 in the Hundred of Mudla Wirra) It is proposed to lay out as a township to be called Buchfelde, after a celebrated professor of that name. A subscription has been raised among several German families in the neighbourhood for the erection of a church and school and application has been made to the government for a grant in aid’. The whole group of new settlers were soon referred to as the ‘Forty Niners’. A school was opened by Ulrich Hubbe, who later became known as the 'Father of the Real Property Act'. It had to close when the Wesleyans set up a rival school in 1852. Samuel Meyers was a teacher at the Buchfelde School from 1859 after Mr Shierlaw resigned. On 24 December 1861 he married Elizabeth Hellier, daughter of Henry Hellier. Sadly his marriage and teaching career were very short as he died on 14 April 1862. He was replaced by C. Simmonds. He was in charge until March 1865 when the Council requested him to resign on the grounds of ‘utter incompetence’. In October 1873 F.L. Morris was instructing some 50 students who were examined that month by Rev. J. Roediger assisted by H. Roediger, W. Wingate, F. bis Winckel, J. Sparshot and E. Gale. After the examinations Morris, who was on the sick list, was replaced by William H. Matthews. When the area was opened up for Workingmen’s blocks in 1891, the school was attended by Blockers’ children until 1908 when the Gawler Blocks School was completed. During September 1893 the school had to close for a fortnight due to a measles and whooping cough epidemic. Regardless of these, and some other problems, enrolments increased and in October 1903 Victor von Bertouch and James Doherty were appointed to the teaching staff. Quality of teaching further improved when Ida Standley was appointed in 1911. She remained for three years until appointed to the Alice Springs School on 6 May 1914. She stayed there until 25 March 1929. Within a short time of their arrival in 1849 the Schomburgk brothers had some 60 acres under crop and cattle and later developed an orchard and vineyard. The vineyard was of five acres, on a bank of the Gawler River, and produced several excellent wines. Dr Schomburgk also introduced the sultana grape to South Australia. The wines enjoyed a splendid reputation in South Australia but after Otto Schomburgk, who had been appointed Officiating Minister for Marriages in South Australia on 13 October 1851, died on 16 August 1857 aged 48, Richard had to manage alone. Schomburgk had his problems as well. In August 1862 his land suffered from floods which reached 18 feet, carrying trees and other rubbish which was lodged between the vines and fruit trees. In some places the soil was washed away to a depth of three feet. In April 1889 Buchfelde experienced its worst floods so far causing again great damage to its orchards. A first for Buchfelde was the establishment of a Meteorological Station. Dr Schomburgk kept a rain gauge and in August 1864 recorded 14 rainy days with a total of 2.88 inches. Although the first years were a time of clearing land, farming, building and establishing the settlement it did not stop several of the 'Forty Niners' to take an interest in the wider world and continue their involvement in science and community affairs. While living at Buchfelde, Otto, who was already a J.P., became one of the first Trustees of the Gawler Town and Investment Society in 1856. Richard became Chairman of the Mudla Wirra District Council in 1861 and the curator of the Gawler Museum. In 1865 he was appointed director of the Adelaide Botanic Garden. After this appointment Schomburgk sold his vineyard to his neighbour Friedrich bis Winckel. In March 1873 the Sydney Empire newspaper wrote, ‘Amongst the most eminent of those who have advanced the work of science in Australia is Dr Richard Schomburgk’. Friedrich bis Winckel, born at Uelzen on 6 May 1819 and his wife Sophia Pauline, nee Beckman, born at Schmoln on 8 August 1824, already had three acres from which he produced a good red wine from Mataro and Shiraz grapes. He too was involved with community affairs and science and occupied many public positions. He became an honourary curator of the Gawler Institute Museum, Chairman of the Mudla Wirra District Council, which had its first meeting in Otto Schomburgk’s house, Member of the Central Board of Main Roads, Member of the local Board of Advice (Schools), Returning Officer for the District of Yatala, Member of the Masonic Lodge and in May 1870 Justice of the Peace. He had a beautiful homestead and orchards comprising fruit trees of many varieties. His wines received several awards. Among them were those of the South Australian Vine Growers Association in 1864 followed by one from the Gawler Agricultural Society in 1865. He even gained a medal in 1867 from Victoria for his 1864 White Tokay. When Friedrich died on 30 December 1879 he was buried at the Buchfelde Lutheran Cemetery. His wife Sophia managed the winery with great success. Winckel Bridge over the Gawler River was later named after him. The Buchfelde Chapel, built earlier, was destroyed by fire in 1862 which proved a major setback for the pious community. However with the help of the neighbouring communities, including the Tanunda Liedertafel who gave a concert on 24 August, funds slowly became available to rebuild it. Julius Roediger, who had made his home at Buchfelde went to great lengths in the rebuilding process. This time it was made of solid freestone and paved with red bricks. The masons carved on a stone set high in the wall in German, Evangelical Lutheran Church of St Paul, built 1863. Before Julius could be installed he had to be ordained first. This was done by the Rev. Lewis of Gawler. Now Pastor Roediger conducted services for other Independent Lutheran communities as far away as Quorn and Morgan. During his frequent absences his wife conducted the Sunday School. The Sunday school played an important part in the community and every April its anniversary was celebrated. Pastor Roediger died in 1897. At the 10 September 1881, anniversary of St.Paul's Sunday School, sermons were preached by the Rev. RW Campbell and Mr Congreve. The attendance was good. On the following Tuesday an excellent tea was provided, the church being beautifully decorated for the occasion. At the public meeting Mr Jones, J.P., presided and addresses were given by Messrs. J Limb, W Dawkins and S Dawkins. There were seven teachers and 41 scholars on the roll. The library contained 200 volumes. Miss C Roediger ably officiated at the harmonium. Proceeds were £6.12s.3d. Replacing Roediger was a major problem. Every ordained Minister in the district was asked to visit Buchfelde whenever possible. For the next 50 years Lutheran, Methodist, Presbyterian, Congregational, Baptist and any other Ministers conducted services in the little church. Eventually the Board, presided over by his son Walter, decided that the church needed an official religious body to look after it and the building and land was formally transferred as a gift to the Methodist Church. Eugene Constance Josephine Marianne von Kreusler, a 38 year old widowed entomologist born in 1811 at Arolsen, Waldeck, and her son Carl Louis Ferdinand Wilhelm and daughters Laura Sophia Wilhelmine and Caroline also settled at Buchfelde. Her widowed daughter Eugene Constance, nee Reuter whose husband had died in South America in 1848, also settled at Buchfelde. Marianne took up land and started farming. She became intimate friends with Dr Hubbe, Dr Schomburgk, Dr Muecke, pastor of Tanunda, and James Martin of Gawler. Kreusler devoted most of her leisure time to natural history. Through her own research, correspondence and exchange with scientists and investigators from all over the world she acquired an extensive collection of specimens such as birds, reptiles, insects and minerals. Her special interest was entomology and with the help of her granddaughter she was able to preserve and mount many of them. She soon established an impressive museum which attracted many visitors and became a focus for naturalists linking South Australia to world centres of science and collecting. Her son Carl married Christiane Freiderike Leopoldt on 17 December 1862 at Buchfelde. After her son’s wedding Marianne Kreusler took in a lodger, entomologist Johannes Odewahn who assisted her. He ended his own life on 12 December 1876 after taking poison. Buchfelde attracted many other settlers of German background. Among them was another naturalist Friedrich Schultze. During the early years of settlement at Buchfelde many children were born and died, as well as some of the adults. Carl Gustave Luis Reinke was born on 27 May 1852 and died on 10 March 1884. Ernst C.L. Kuhne and his wife Anna lost their three year old daughter Ida on 27 August 1853 followed two months later by daughter Emilie on 22 October, aged only four. The Harders family of Johann Hartwig and wife Hellwig Caroline had a son on 30 November 1859. They named him Johann Heinrich Paul. Their daughter Christiane Rosalia Amalia was born on 24 April 1861. William and Fanny Alderman suffered a heavy loss in 1865 when their daughter Sarah Jane died on 13 March, aged 10, followed three weeks later by Fanny, aged 14 on 5 April. A happier event occurred on 24 January 1881 when Heinrich Preiss’ wife gave birth to a healthy son which they named Sidney Albert. On 24 September 1898 C.R. Roediger died aged 66. Born in Germany he soon left for the Victorian goldfields with his two brothers where they were very successful. On their return to South Australia they settled at Buchfelde with their parents and engaged in farming. After about five years C.R. became a wheat buyer and storekeeper in Gawler. He was buried at Buchfelde. Where his brother Hermann still resided. By the turn of the century most of the original ‘Forty Niners’ had either died or moved on to other locations. The original colony of scientists and academics that had made such important contributions to many different fields of learning and culture in South Australia was soon forgotten. The name of Buchfelde was altered to 'Loos' in 1917. Initially the name 'Matturi' (Aboriginal for 'liberality') was intended, but this was altered to 'Loos' which is a locality in France, the scene of a battle in 1915 during World War I. The recent publication by Pauline Payne, The Diplomatic Gardener: Richard Schomburgk: Explorer and Botanic Garden Director and Germans, Travellers, Settlers and Their Descendants in South Australia, edited by Peter Monteith will hopefully go a long way rectifying this. Schomburgk died on 24 March 1891 and is buried at the North Road Cemetery.